Goal Tree: how to assess Necessary Conditions status? 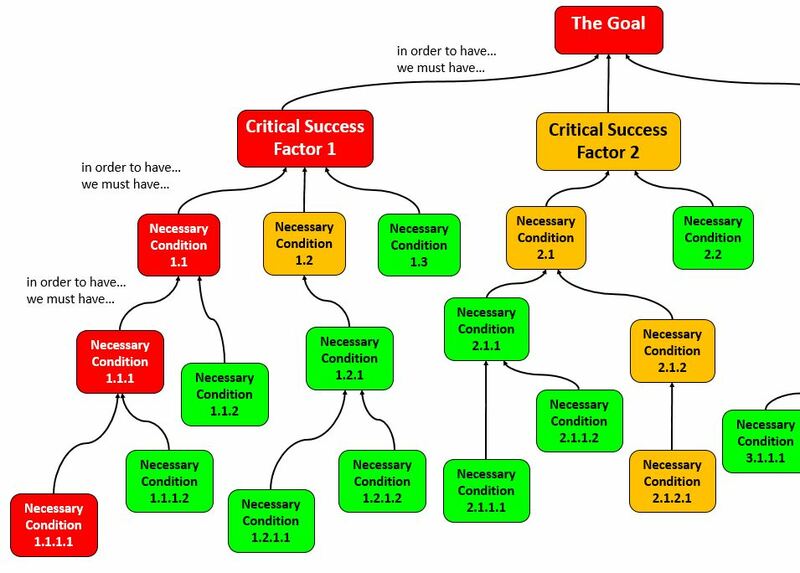 Once a Goal Tree is completed, I recommend to assess each box, mainly Necessary Conditions (NCs) for its status and make that status immediately visible with the three Green / Amber / Red colors, according to the completion and mastery of the box content. Green is the status when condition is OK, steadily and in a managed way. Red is the status when condition is not fulfilled. It may be something missing, something not yet addressed, something which is not mastered or which fails quite often. Amber is somewhat in between, it is a warning that the condition is not perfectly or completely fulfilled, the condition may be unstable, not always granted. My advice is that every organization defines how to assess the NCs in broad lines and for each NC defines one or two metrics that can backup objectively the status. The Goal Tree is built on the logical necessity logic relationship, therefore all Necessary Conditions must be fulfilled (Green) in order to achieve the Goal. We can say that the goal is to have a green tree, or in other words, the staff’s contributions must strive to turn all NCs into Green status and ultimately the Goal will “mechanically” be achieved. Conversely a Tree in autumnal colors holds a lot of improvement work to get it green. This is important as the Goal statement may not be very meaningful to every contributor, while the breakdown into NCs will give all contributors a lot of concrete improvement targets. The Goal of an airline company is to “provide the best travel experience to their passengers”. What contribution to this goal could a sales counter clerk propose ? He/she may have numerous good ideas about what makes a flight enjoyable, but this is not about brainstorming and creativity, this is about daily achieving something that insures the Goal is achieved. Behind the sales counter, the link between the daily work and the company’s Goal may not be that obvious. The Goal’s breakdown into a limited number of Critical Success Factors and far greater number of specific NCs makes things concrete. Some NCs will be linked directly to clerk’s job, like asking if passengers has a special diet, a preference for a window, middle or aisle seat, kindly explaining the luggage limitations, and so on. Maybe one of the NCs states that the ticket purchase should not last more than 7 minutes on average, a benchmark taken from a passengers’ inquiry (Voice of the customer). The statuses of such kind of NC is relatively easy to assess: the questions are regularly and kindly asked to customers, the average purchasing lead time is in its timely limits, etc. ← Goal Tree: what is a Necessary Condition?